Bird Island lies 105km northwest of Mahé on the edge of the Seychelles bank. With a land area of 70ha, Bird is the most northerly of the Seychelles islands. Formerly known as the Ile aux Vaches, after the dugongs that could be found in the shallow waters around the island, these gentle giants have long disappeared, becoming locally extinct soon after the appearance of humans. Today Bird Island is home to 300,000 pairs of sooty terns which breed during the southeasterly trade winds. 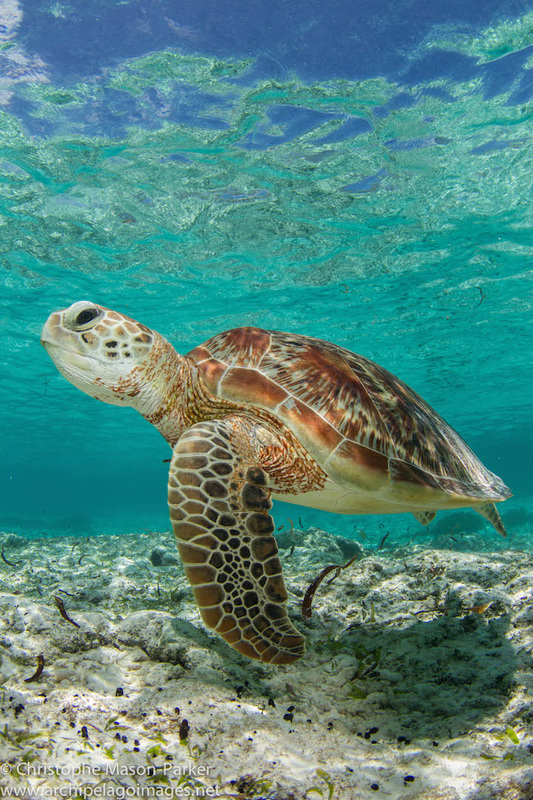 The sandy beaches are important nesting sites for the critically endangered hawksbill turtle, while in recent years a population of green turtles has made the warm, clear, waters and extensive seagrass beds their home. 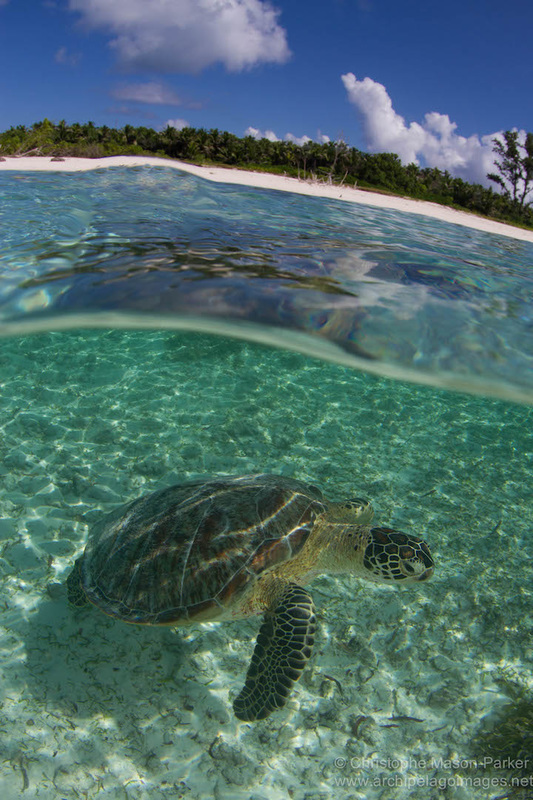 A young green turtle swims above the seagrass beds in the shallow water surrounding the south coast of Bird Island. 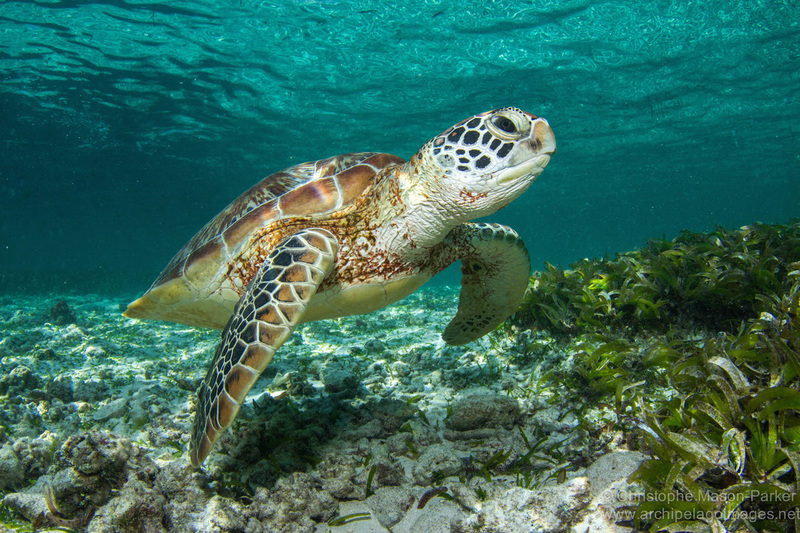 The green turtles appear on the seagrass beds as the tide rises. They spend their time in the shallows consuming vast quantities of the nutrient poor seagrass before heading back out onto the reef as the tide recedes. 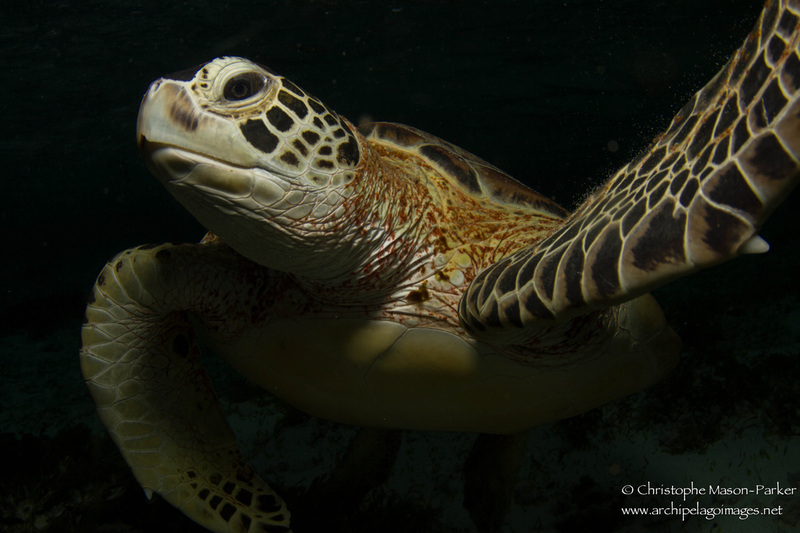 The Green Turtle (Chelonia mydas) is listed on the IUCN Red List as endangered. It has been protected in Seychelles waters since the early 1990s where previously it was heavily hunted for its meat. Today only small remnants of nesting populations remain within the inner islands of the Seychelles, though the species is more abundant in the outer islands, in particular Aldabra. At least a dozen green turtles have taken up residence in the waters around Bird Island and in particular the area known as Pass Coco where they congregate amongst the seagrass beds to feed on the rich Thalassia meadows in the shallow waters. The population is made up of adults and juveniles and over time certain individuals have become habituated to the presence of snorkelers. The lack of fear exhibited by certain individuals allows for close up encounters over sustained periods of time. As afternoon turned into evening the turtles continued to feed. The tide was still rising so there was no need for them to move to deeper water. In the end as darkness fell I exited the water and left the turtles to their evening meal. 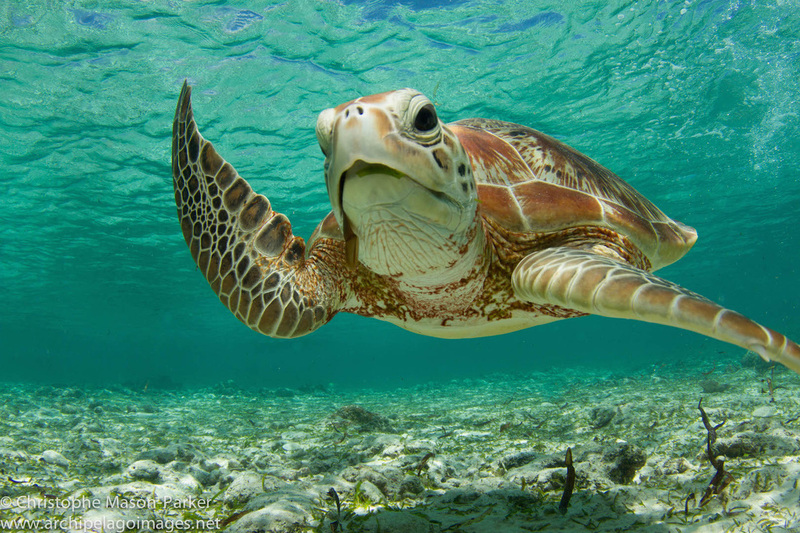 When feeding green turtles tend to surface to breath approximately every five minutes. If completely relaxed and sleeping they can remain under water for several hours at a time. There is a direct correlation between breath holding ability and stress. The individual below spent over an hour feeding in 2 metres of water, occasionally surfacing for air before returning to the substrate in search of more seagrass. Although aware of my presence it was completely at ease allowing me to approach closely while it fed. 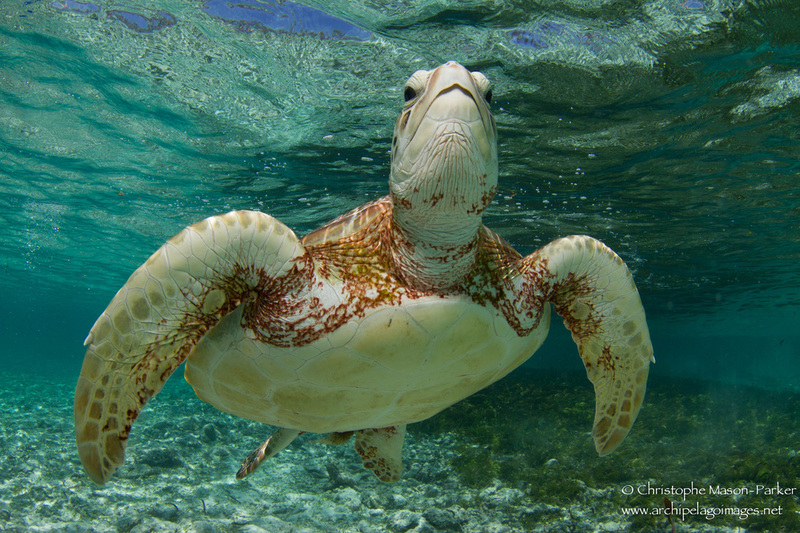 A juvenile green turtle rises from the seabed in search of a gulp of air.